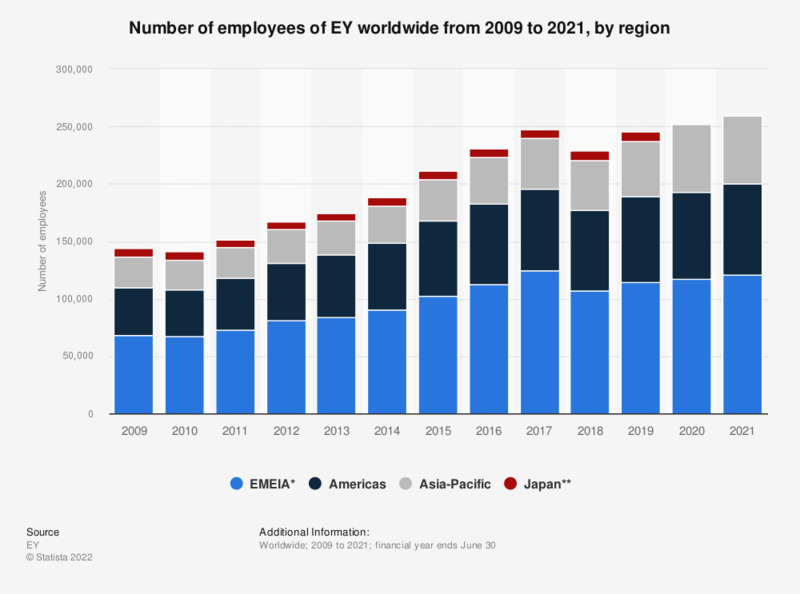 This statistic shows the number of employees of EY (Ernst & Young) worldwide from 2009 to 2018, by region. In the fiscal year of 2018, EY employed 43,722 people in the Asia Pacific region. In a ranking of the top consulting firms in the United States in 2018, EY (Ernst & Young) ranked seventh with an overall prestige score of 6.35. Increased competition from new firms and competitors is the leading business challenge for management consulting firms worldwide. ** Values from 2018 do not add up to the total employees, with some global shared services employees not included in regional totals. Values do not add up to the total employees.